A simple string pulling exercise that will change your life! If you play C6 tuning with an E first string, you know how difficult it can be to play harmony in 3rds on strings 1 and 2 (E and C). This is especially true if you play a longer scale neck, like I do. The reverse slants required to achieve a minor third interval can be daunting, cumbersome, not easily pitched, and have a distinct whine or ‘meow’, which is in essence almost like a sitar effect where a longer than necessary part of the bar is making contact with a string. In the short video, you can hear the effectiveness of subtle string pulling to make a more seamless transition than with reverse slants on the adjacent strings 1 and 2 (E and C). This is a trick I use to get a pedal steel-esque sound sometimes when I need to. A volume pedal comes in really handy, too. This type of exercise needs to be learned in every key using every scale. That seems like a big demand, but it really isn’t if you dedicate a few minutes per day to doing it. It becomes second nature in time. I don’t want to get too deep into explaining the process, but do your best to make every pull sound in tune and learn to feel the difference in string tension as you move further up the neck. 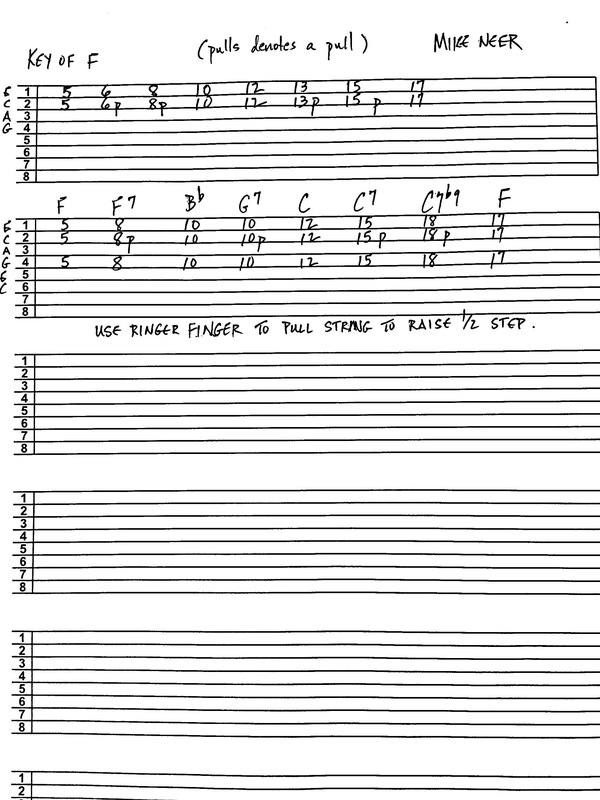 This tab for the top 2 strings in C6 tuning for an F Major scale, which is what I used in the video. The ‘p’ next to a number indicates a 1/2 step pull.